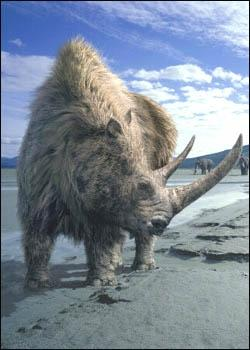 The Woolly Rhinoceros (wool-y ry-no-sir-us) was one of the biggest, and the furriest rhinos that has ever lived. This Rhino lived with Neanderthals (nee-an-der-falls) and the modern human during the ice age. 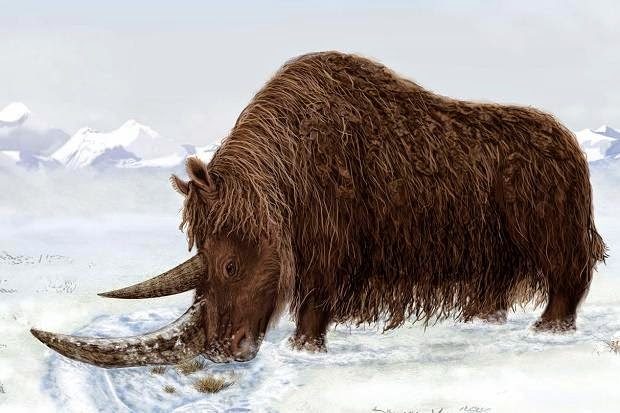 The Woolly Rhino was part of the megafauna (me-ga-fon-ah) which means that it lived during the time of giant animals, including the mammals, reptiles, and birds. The Woolly Rhinos horns where huge, the front one being about 61 cm (24 in) in length on average. The horn was not just for defense though, the horn was also used as a shovel to uncover grass and roots under the snow, and also may have been used to attract mates. Elasmotherium (el-as-mo-ther-e-um) was the largest horned rhino that has ever lived, it was as big as a mammoth. The over grown horn is thought to be two horns fused together and over time it created only one horn in the middle of the animals head. 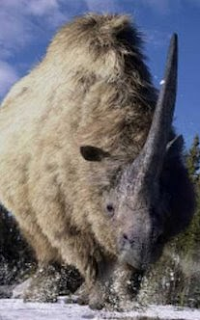 The Elasmotherium is also known as the giant unicorn, because of the huge horn that appears to be on its forehead. Quite a ways off from the horse with a horn that we grew up with. The Elasmotherium became extinct do to hunting by humans and maybe even Neanderthals as well as carnivores and climate change. Ah, but the Paraceratherium or Indricotherium was the biggest hornless rhino of all time. The Elasmotherium however was the biggest horned rhino of all time. Not only that but they may have been related but the Elasmotherium is in the same family as modern rhinos (Rhinocerotidae) but Paraceratherium was in a different family (Hyracodontidae). Though I will edit this so that it's more clear. Thank you.